In July 2012, we held the 1st Worldwide Youth Uchinanchu Festival in Sao Paulo, Brazil. 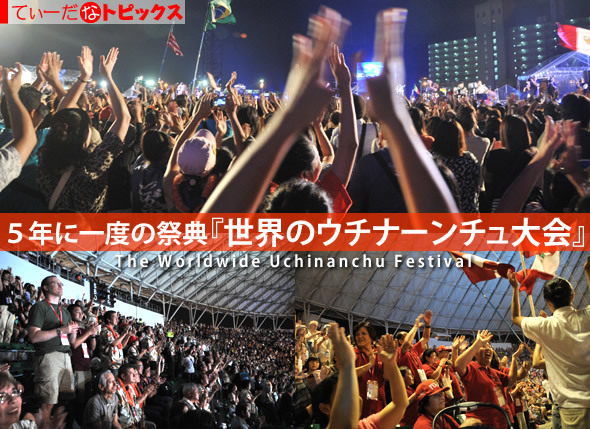 In July 2013, the 2nd Worldwide Youth Uchinanchu Festival in L.A, USA. Approximately 85 youth uchinanchus from 8 different countries participated, and this festival was successful in regards to strengthening and reinforcing the Uchinanchu network. We are extremely grateful and thankful from the bottom of our hearts for all the help and support we received, especially to the co-organizer, Okinawa Association of America, Inc. (Los Angels Wakamono Taikai Support Committee) and WYUA USA Wakamono Taikai Planning Committee. We couldn’t have organized it without their support. We are also pleased to announce that we have decided to host the 3rd Worldwide Youth Uchinanchu Festival in Dusseldorf, North Rhine-Westphalia, Germany. We have already started preparing for the festival and would like to count on your support. If you can spread the word and inform your youth members and other youth groups about this Festival, there is no limit to our potential of becoming a unified Uchinanchu network all across the globe. The attached documents contain an outline of the 3nd Worldwide Youth Uchinanchu Festival Germany 2014, a poster. Please check if all the files are there. In addition, we are planning to hold the Worldwide Youth Uchinanchu festival 2015 in Philippines and 2016 in Okinawa. In 2016, we are absolutely certain that both the 6th Worldwide Uchinanchu Festival4 and Youth Uchinanchu Festival will be a joint-event beyond imagination. We kindly ask for your ongoing support. Again, thank you very much for your cooperation! 1 From l’Association des ressortissants Okinawaiens en France, 6/17/14. 3 From Okinawa Peace Network of Los Angeles. 4 Dates of previous Worldwide Uchinanchu Festivals: 1st, 23-26 Aug. 1990; 2nd, 16-19 Nov. 1995; 3rd, 1-4 Nov. 2001; 4th, 11-16 Oct. 2006, 5th 12-16 Oct. 2011. Some of these dates include the parade, which precedes the opening day. This entry was posted in Culture, Festival, International, Travel. Bookmark the permalink.